Shares of Chipotle (NYSE:CMG) have been hotter than a chili pepper the past month. Chipotle stock has risen 12 out of the last 15 days after making a low at $385 on Christmas Eve. Chipotle stock is now up an astounding 130 points, or 33%, over those 15 days. Certainly some of the run up was warranted given that CMG stock had become deeply oversold. The rally, though, is starting to look tired and toppy. I look for Chipotle to pull back over the coming weeks. The stock is getting extremely overvalued from a fundamental perspective. CMG now sports a P/E north of 70, a big multiple expansion over the past two years and well above the norm over the past 10 years. Other metrics, such as price-to-sales and price-to-free cash flow, also are flashing red. In this momentum driven market of late, valuations have become greatly discounted. Ultimately, however, valuations do matter and Chipotle is looking decidedly overvalued, especially now that the momo has slowed. 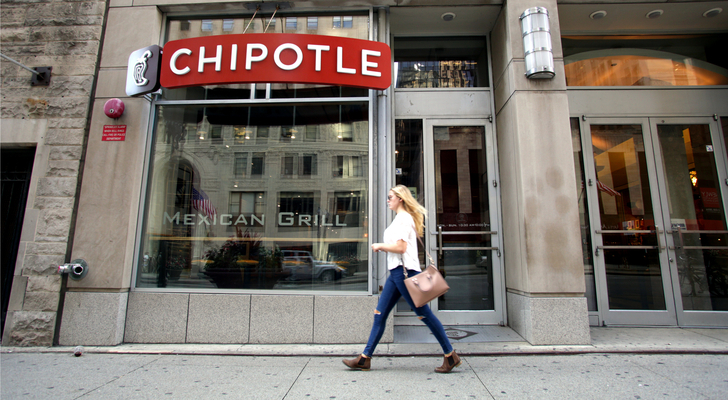 The analysts covering Chipotle stock have a less than sanguine outlook on the shares. 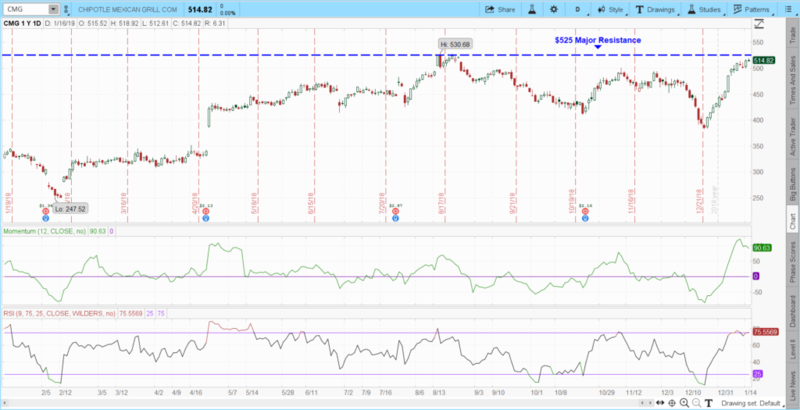 According to Tip Ranks, the average price target for the 20 analysts covered is just $479.32, or nearly 7% lower than the current price of CMG. Corporate insiders are also thinking the stock may be due for a drop, selling nearly $56 million in Chipotle stock over the past three months. The combination of professionals being less than bullish and insiders starting to lighten the load usually portends to a lower stock price. CMG is also looking a little frothy on a technical basis. Chipotle stock is fast approaching major overhead resistance at the $525 level. Momentum reached the highest reading of the past year before weakening over the past few days. The nine-day RSI is also way overbought after breaching 75. The past several days have seen CMG stock struggle mightily to head higher. The buyers may finally be getting exhausted at these lofty levels. CMG stock is overvalued fundamentally and overbought technically. Analysts and insiders have a bearish outlook. To me, this all points to a lower Chipotle stock price in the intermediate term. I would short CMG at current levels and look for it to retrace back well below $500. Earnings are due Feb. 6 after hours. Article printed from InvestorPlace Media, https://investorplace.com/2019/01/rally-in-chipotle-stock-too-spicy/.